When you export your storyboard as a PDF document, by default, only the first frame of each panel is exported into the document. Likewise, if you export your storyboard as bitmap images, each exported image will contain the first frame of its respective panel. 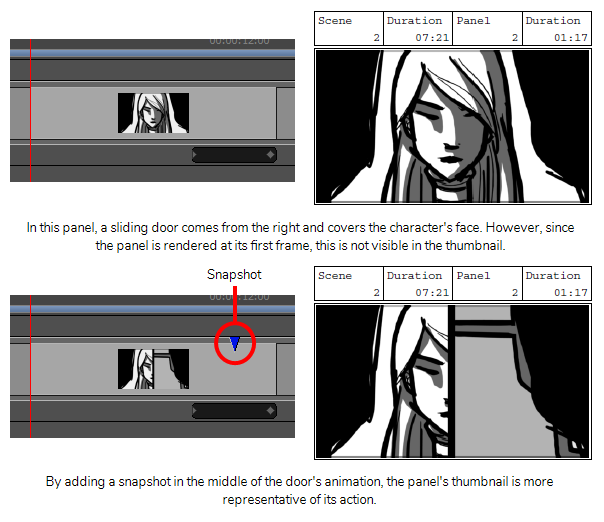 However, there might be situations where a panel is better represented by a specific frame in the middle of the panel rather than its first frame. For example, if the panel has a lot of layer animation, one of the in-between frames of that animation could be a lot more descriptive than the panel's first frame. Using Snapshots, you can indicate to Storyboard Pro which frame in a panel is the best frame to represent that panel when exporting it as a still image. A snapshot is simply a marker positioned on one of your panel's frames. When you export your storyboard as a PDF document or as bitmap images, if one of the exported panels contains a snapshot in one of its frames, this frame will be used to represent the panel in the exported image, instead of the first frame of the panel. You can add several snapshots to a panel. When you export your storyboard as a PDF document, each frame that is marked with a snapshot will be included in the storyboard, allowing you to export more than one frame for a single panel if necessary. When exporting your project as bitmap images, you can choose whether only the main snapshot of a panel that has several snapshots should be exported, or all of its snapshots. When a 3D scene which contains a camera movement is exported in a PDF document, the panel is usually represented by two thumbnails: the first frame of the camera movement, and the last frame of the camera movement. Adding a snapshot to such a panel adds an extra thumbnail in the PDF. Using snapshots is completely optional and flexible. If you add a snapshot to a panel, Storyboard Pro will use the snapshot when exporting the panel as a PDF or as a bitmap image. If you don't add snapshots or if you delete snapshots from a panel, Storyboard Pro will use the first frame of the panel. When you add a snapshot, it is always added at the current frame, so you know what the panel will look like when you add a snapshot by looking at the Stage or Camera view. A marker for each snapshot is added to the Timeline view to help you keep track of them. NOTE Snapshots do not affect the exported images when exporting layouts.